Cameron Norrie continues his climb up the world rankings. His 6-4 6-4 win over Adrian Mannarino of France took him into the last four of the Abierto Mexicano in Los Cabos. He will face Italy’s Fabio Fognini for a place in the final. Norrie won nearly three-quarters of his first serve points as he dismissed the fourth seed and world No 25 to reach his second successive ATP Tour semi-final. He is already guaranteed to hit a new career-high ranking inside the top 70 and will bid to reach his first main-tour final. Heather Watson took Venus Williams to three sets before succumbing 6-4 4-6 6-0 at the Mubadala Silicon Valley Classic in San Jose. The No 2 seed broke Watson twice and lost one service game in the first set, while the Briton did similar in the second. But the third saw Watson overpowered as Williams won the match in an hour and 51 minutes. Williams said: “It was a tough match and she played incredibly. “There were times where I had no answers. But Katie Boulter was unable to make it a British hat-trick in her delayed second-round clash in Washington against qualifier Allie Kiick. Boulter, who had dismissed fifth seed Aleksandra Krunic in the first round, lost her serve to love in the opening game of the match and found herself a set down after 38 minutes. 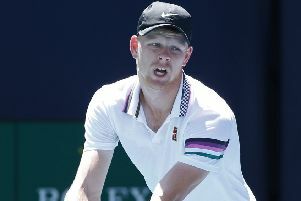 The pair exchanged two breaks each in a more closely-fought second set, before 21-year-old Boulter found some momentum and broke again to level the match and force a decider. But her American opponent fought back strongly in the final set, taking three breaks of serve to clinch a 6-4, 5-7, 6-1 victory.